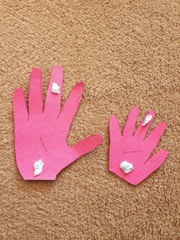 For Father's Day this year we went for all homemade presents. 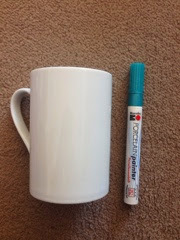 I'd seen lots of Pinterest boards where people used Sharpies on mugs (with mixed results) but then I found these brilliant ceramics pens in Hobbycraft and thought I'd give them a try. I got two mugs in Tesco for 89p each and got to work. I went with my babies hand prints (only because I thought it was the easiest option). So I cojouled the toddler into letting me draw around her hand and did the newborns whilst he was asleep. 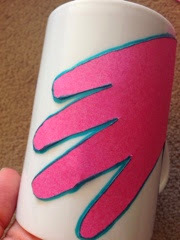 I placed them on the mug and drew around them. Then had to wait for four hours and then I could bake it in the oven. 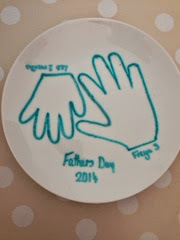 I also then got all creative and decorated a plate too for my dad. 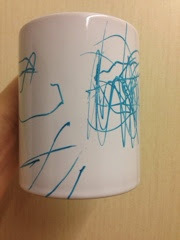 With my spare mug I decided to let the toddler go wild with the pen. I was nervous and she was dizzy with excitement and this was her creation for daddy to use at home (the other mug went to work). I know it's rather 'scribbly' but my girl doesn't bother herself with colouring or pens of any sorts usually so this in itself is amazing.